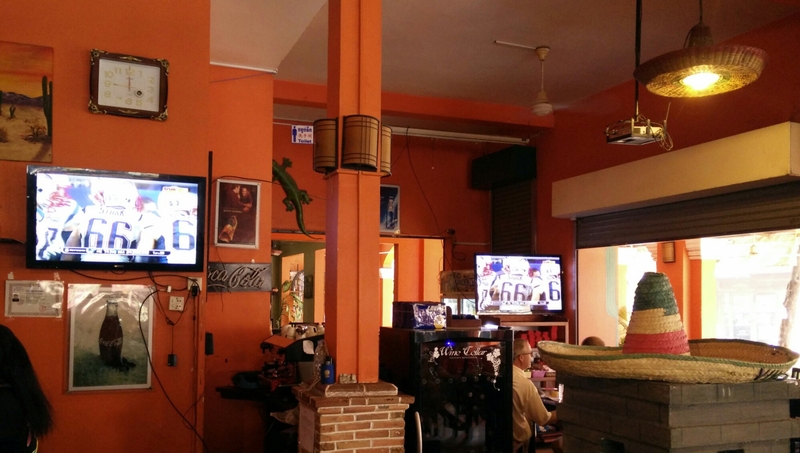 Embracing new experiences, we got up before 7 AM to go to a Mexican bar to watch the Super Bowl! Seahawks fans were louder and prouder than the Patriots, and I’m not sure how much their shouting helped the local staff and bystanders understand the game! Strangely, the TV feed had no commercials during possibly the only time I wanted to see them! 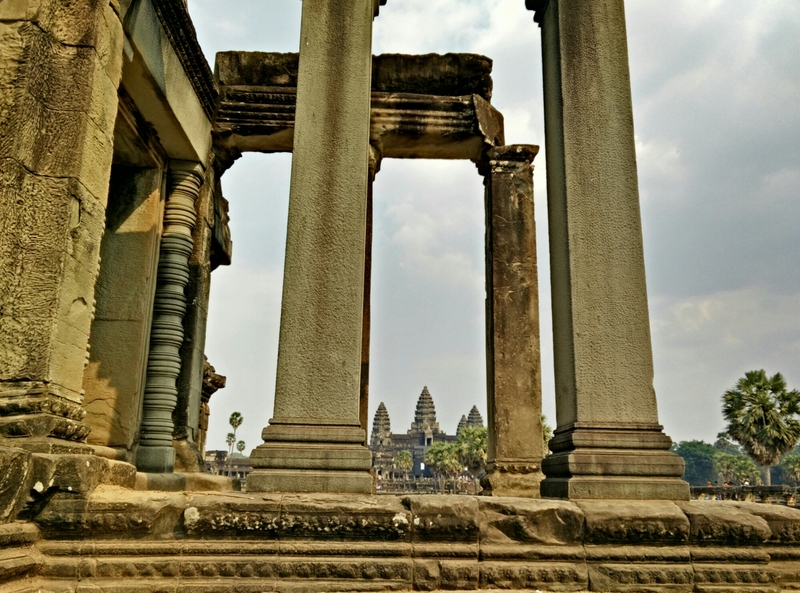 With a championship under our belt, it was time to head to the temples of Angkor Wat where fighting traditions and dancing girls were also revered. Built between 800-1350 A.D. Angkor Wat is actually only one of about 1000 ancient temple remains in the 390 square mile area. Angkor Wat itself is surrounded by a 2.2 square mile moat, which is but one feature making it a favorite sunrise destination. Our dilemma was how to get there on this 90 degree day. 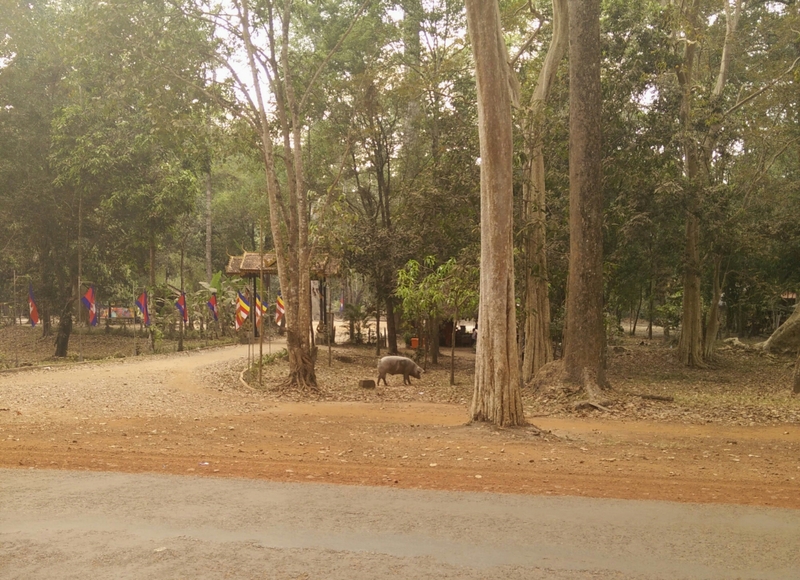 Eventually we set out on bikes to the temple complex about 5 miles from our Siem Reap hotel. 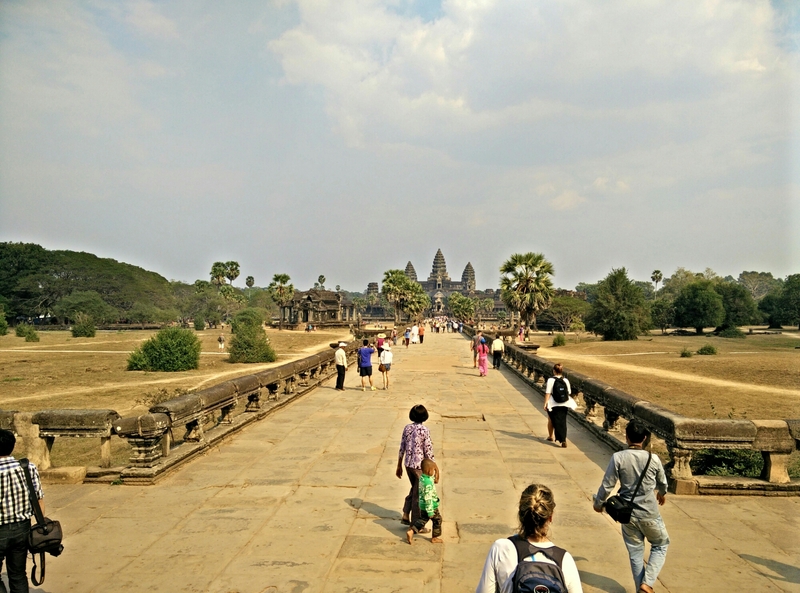 The heat hadn’t stopped the other 6000 visitors a day from enjoying Angkor Wat. Though initially congested, we were able to find a quiet spot to take in the beauty. 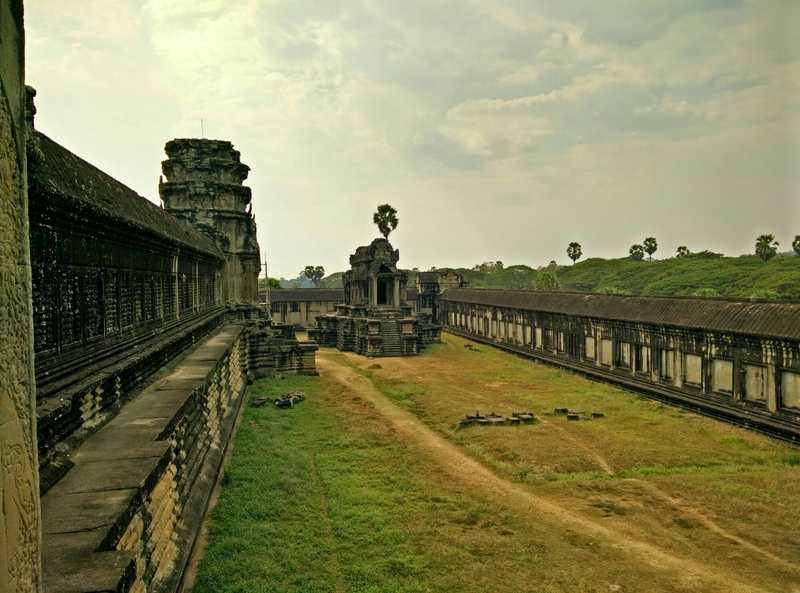 We’d read up a bit on the history of changes from Buddhist to Hindu temple, and about the carvings of legends in the walls leading up to the main temple. Bikes gave us flexibility to explore further, so off we went to other temples. En route we spotted elephants, a way cooler way than bicycles if getting around. Wild monkeys were also about, and one enormous wild pig! Not to get templed out, and more so not to be biking in the dark, we headed back. Maybe it was rush hour, as the local road became a free for all! 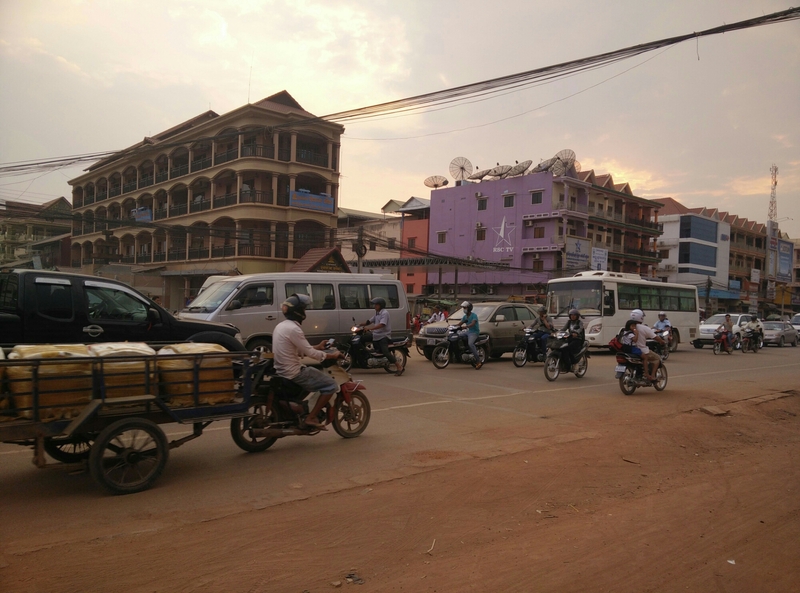 Watching a twelve year old on a bike navigate a sea of scooters, cars and buses, I gathered my courage and followed T back to the hotel. I was rewarded with the pool and dinner at George’s Rhumerie. George has specialized in making various fruit rums and chutneys and offered tastings of all. A heavenly way of ending a day of temples! nice pictures. what kind of camera are you using during your trek that is not a travel burden. I like the shot with angkor wat not so focused on the background in particular. stay safe in your journeys. we could use some 90 degree weather to get rid of some of the excess snow.